This sample project demonstrates how to use the ADO 2.1 Filter property with a criteria string to filter data in a Recordset. Add two command buttons, a listbox, two textboxes and two label controls to the form. Set properties on the controls as listed in the following table. When you're done, the form might look like this. 'Build the filter string using textbox entries. 'Connect the listbox to the recordset. 'Display filtered contents in listbox. 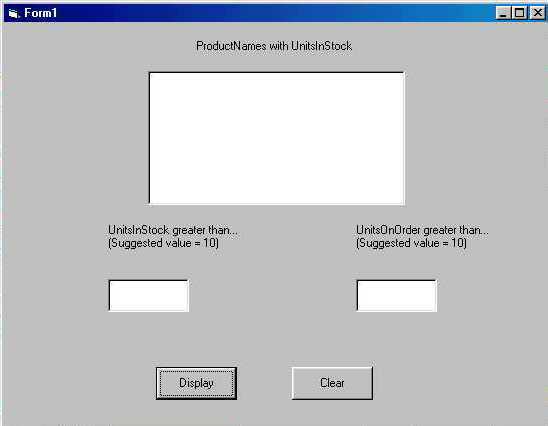 lblUnitsInStock.Caption = "UnitsInStock greater than..." & vbCrLf & "(Suggested value = 10)"
lblUnitsOnOrder.Caption = "UnitsOnOrder greater than..." & vbCrLf & "(Suggested value = 10)"